FileZilla is the popular FTP client which is used to move files from your local system to FTP server and vice versa. In FileZilla, we can save the FTP login details of various websites. So, you do not need to enter details each time you want to login. You can just go to site manager and select the website in which you want to login and connect. But what if you want to see the password saved in your FileZilla site manager. You can neither see the password nor copy it. If you are regular FileZilla user, you already know it. But Many people new to FileZilla struggle in this. There is a quick way to see the saved password in FileZilla. You can export the site manager entries to see the saved password. Follow the given steps. Step 1. Open FileZilla client. Step 2. Click on File Menu and select ‘Export’. Step 3. 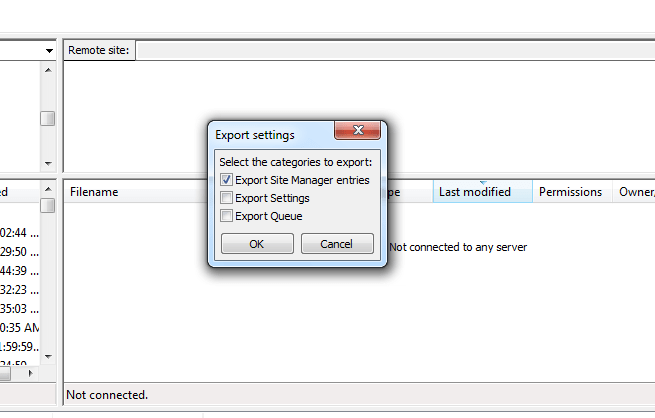 In the small dialogue box, select “Export Site Manager entries” and then select ok. Step 4. Then it will ask to select the location to save the xml file. Select the location where you want to save the file. Step 5. Now open the saved XML file in notepad. In this XML file, you will find all the FTP details you saved in FileZilla. Step 6. Select the Host and then find the password between the <pass></pass> tags. By this quick way, you can easily get the stored password. And you do not need to go and reset the password from cPanel. This was quickest way to see the stored password of FileZilla. Just try this and see the password. If you have anything else to ask about FileZilla or any other software, you can always leave a comment. I will try to answer that with a new article or a comment. If you found this article useful, please share with others.